Hours... hours... hours were spent on this little sweetie. I guess with the amount of time I spent on her, I feel like I can be more than a bit proud. :) It's not very often that I work something out in my head and it turns out exactly as I had planned, but this is one of those very rare times. I love her! She'll be traveling to Renegade Chicago with me in September. I'm so happy to finally feel like I had my creativity back again! I have so many things in the works... I can't wait to get some more new things made up! I hope you are all having a lovely weekend! ooooooooooooooooohhhhh!!! it's ears are my favoritest! I love her! Ooh I should try & get to Renegade this year.. it is only about 3 hours from where I live. :) You should be proud.. she is AMAZING! You are soooo talented! xo! oh wow. she is so adorable. definitely one of my favourites if not my very very favourite. 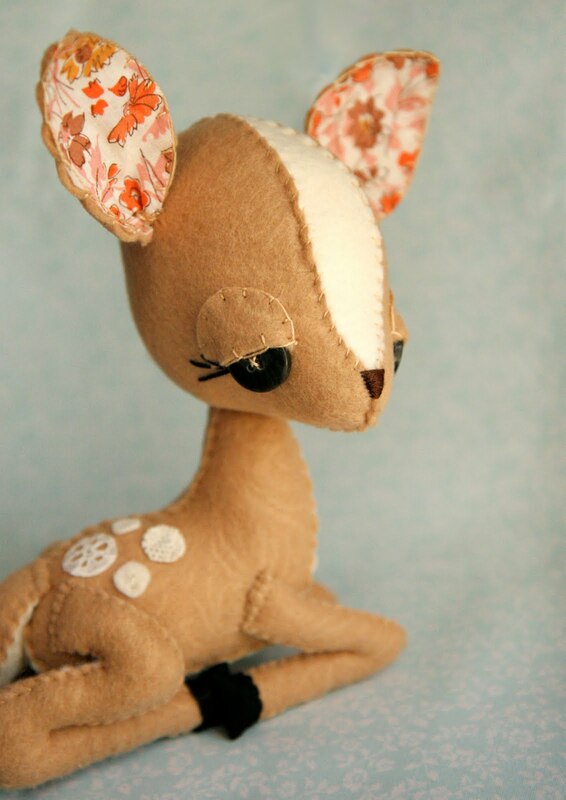 i especially love the detailing on her spots and the fabric in her ears. too cute! you did a wonderful job and you should be proud! wow that is the sweetest little baby deer ever! you did a great job! Her spots are precious Katie! Be proud! She is beautiful. this is sooo cute! i absolutely love it! she's so beautiful katie! i can't wait to see her in person! I love it! So, so cute! I hope that you will have those for sale soon in your shop! Ahhh-mazing!! The leg detail is so sweet!! Love your stuff! great work Katie, be proud! What a beauty... You are oh so gifted! That's way too precious! You're one talented lady! She's precious! My favorite so far! OH my goodness pleaseee put one of these in your shop! I am so in love! Oh my goodness!! I love her! 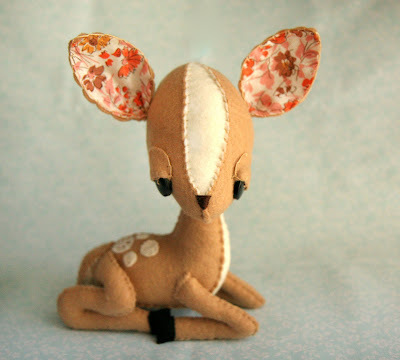 Will you be making any siblings for your etsy? you have amazing attention to detail, it must be very rewarding to see the final product come out after careful planning!! does renegade ever make it say, nearabouts CO?? haha i would be there in a heartbeat to meet your creatures. they are so original and fantastic. She is the cutest lil thing ever! Really incredible. she's absolutely lovely! i hope you'll make some for the shop one day! Holy cow, she is SO adorable, i can barely stand it! Gorgeous, lady! She is going to be a sweet little sidekick for Chicago! That little beauty makes me swoon. LOVE HER! oh, she's so pretty! i think she's my favorite. 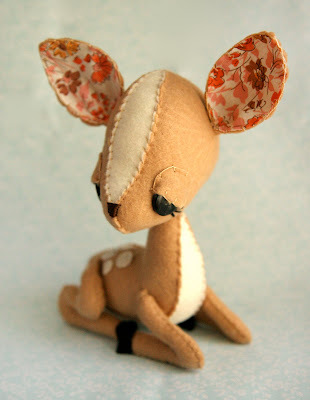 She's so sweet, love her:) What are the spots, felts and recycle lace? so adorable Katie!! You're amazing! Oh my lord! I looooove this! Oh so VERY cute! I hope you keep the first one, and make other ones to sell, it'll be like a trophy of creative accomplishment! she is too cute for words!!! omg this little guy is sooo cute!!! how absolutely precious - I'm typing this one handed as my little one is reaching towards the computer screen for fawn cuddles :) - really really hope that you sell this and you ship to Sydney!! Is there a particular name that you know of for this style of plush? I'm trying to find a pattern to try so I can learn how to sew them but I can't find anything anywhere. Do you use patterns or do you make your own?